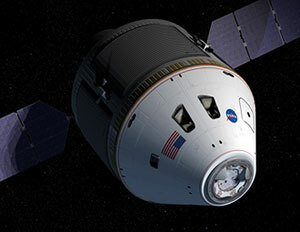 NASA announced Tuesday that its new crew exploration vehicle will be named Orion. Orion is the vehicle NASA’s Constellation Program is developing to carry a new generation of explorers back to the moon and later to Mars. Orion will succeed the space shuttle as NASA's primary vehicle for human space exploration. Orion is named for one of the brightest, most familiar and easily identifiable constellations. "Many of its stars have been used for navigation and guided explorers to new worlds for centuries," said Orion Project Manager Skip Hatfield. "Our team, and all of NASA - and, I believe, our country - grows more excited with every step forward this program takes. The future for space exploration is coming quickly." In June, NASA announced the launch vehicles under development by the Constellation Program have been named Ares, a synonym for Mars. The booster that will launch Orion will be called Ares I, and a larger heavy-lift launch vehicle will be known as Ares V. Orion will be capable of transporting cargo and up to six crew members to and from the International Space Station. It can carry four crewmembers for lunar missions. Later, it can support crew transfers for Mars missions. Orion borrows its shape from space capsules of the past, but takes advantage of the latest technology in computers, electronics, life support, propulsion and heat protection systems. The capsule's conical shape is the safest and most reliable for re-entering the Earth’s atmosphere, especially at the velocities required for a direct return from the moon. Orion will be 16.5 feet in diameter and have a mass of about 25 tons. Inside, it will have more than 2.5 times the volume of an Apollo capsule. The spacecraft will return humans to the moon to stay for long periods as a testing ground for the longer journey to Mars.